Bre Pettis, a former schoolteacher (and producer of MAKE’s popular “Weekend Projects” video series), recently sold his 3D printer company MakerBot to Stratasys. We talked to Pettis to find out why he sold his company, and what his plans are for the future of affordable 3D printing. Tell me about your most recent product, the Digitizer, a 3D scanner that sells for $1,400. I really wanted to have a 3D scanner — something that would be easy, that would get the job done, and that would be as affordable as possible. What was out there started at about $3,000 and went up. It turns out that the hardware on this is not terribly hard. You have a turntable that moves around. You have two lasers. We use nice line lasers — quality does matter on this. And then you have a webcam and a really fancy filter, which filters for 650nm. The idea is that the camera will only see the color of the laser line. It’s just a beautiful machine. I’m really proud of it. We finished it in July 2012, and it took us that long to develop it from a project into a product. When you’re dealing with big injection-molded pieces, the tooling costs more than $100,000. You can only really justify doing that when you know you’re going to sell tens of thousands of them. If you’re not going to do that, you might as well stick with laser-cut wooden parts. One of the cool things about this is it’s also made for manufacturing. The screws on this are all on the top so that it never needs to be flipped over. There are little tricks like that that mean that we can just crank these things out. Does it offer the same resolution as the Replicator 2 — 100 microns? Because a scanner turns an object and the laser fires at it, the resolution is radial. It actually does 800 different points around a circle. While the layer resolution is important on a MakerBot Replicator 2, the radial resolution is what’s important on the Digitizer. It ends up with a model that’s usually more than 200,000 polygons, which is pretty darn good. In June you were acquired by Stratasys, which was a really nice sale. You now have a great amount of stock in Stratasys. It’s a testament to the company you built and the great products you’ve developed. Could you tell me the reason why you sold it to Stratasys, and how that’s going to help you outpace the competition? I had been on track to go around and raise another round, but in the middle of it, Stratasys expressed an interest and because they’re sort of the grandfathers in the space, they were really the only people we would have considered merging with. They’re also just good people. We got into the thick of it, negotiated it, made it work. It’s interesting, we get resources now. Rather than me going out and raising money, I have the resources of a public company to dip into. One of the things that I don’t know if many people realize is that we spent a lot of time at MakerBot routing around the intellectual property of the big companies. There’s probably around eight patents that we couldn’t have that we had to work really hard to route around to be able to have our products. Now we don’t have to stress out as much about it. We actually get access to IP that we didn’t have before. Is that because Stratasys holds those patents? Stratasys has about 800 patents in the space. There are some other 3D patents, such as laser sintering, which are due to expire soon. Are you looking into how you might incorporate them into what you’re doing? Yes, it’s interesting. From the beginning, we could only do what we did because the original patent expired. But since then, there have been a lot more patents. It’s one of those things where we had to decide early on that we were going to be a sustainable company, that we were going to grow, and we were eventually going to be a big company. So we had to invest in intellectual property because the patent system is really weird — you want to basically have enough IP that you can survive. We have a patent on our automated build platform. We have some networking patents. We have some interesting stuff that basically allowed us to get ready if we ever had to go head-to-head with anybody. But the acquisition sort of solved that as well. It turned out really well for everybody. 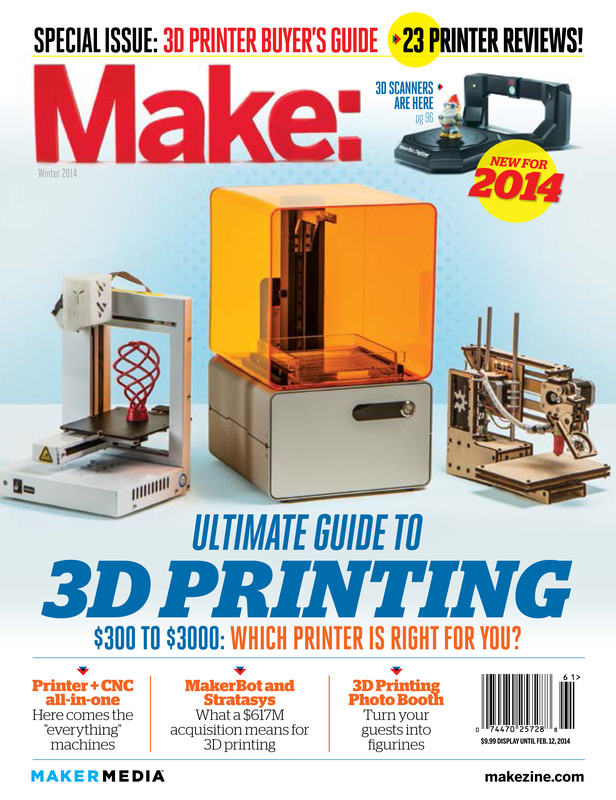 This article first appeared in MAKE’s Ultimate Guide to 3D Printing 2014, page 20. Check out the full issue for more!